The band originally started out with the name of MYSTO DYSTO and in 1986 they released a vinyl only record called "The Rules have been Disturbed". The band then changed their name to MANDATOR and recorded an excellent demo called "A.I.D.S." (An Invisible Disease Strikes). The A.I.D.S. demo contained four songs out of which two reached their albums. (The title track on "Perfect Progeny" and Evil Dead on "Initial Velocity"). At the time they were considered the one of the best speedmetal bands in the Netherlands. They received their record deal with (the now defunct) Disaster Records through intensive playing of their demo on the number one Metal radio show in the Netherlands at the time called Vara's Vuurwerk (Vara's Fireworks). Mandator issued a competition for the fans to name the title of the first album and "Initial Velocity" was chosen. The band split up shortly after the release of "Perfect Progeny" and apparently has not been heard from since. It is unknown if any of the members are still in the music business. Initial velocity Disaster 1988 "Initial Velocity" was released in 1987 and is an excellent piece of traditional Heavy Metal with some speed and thrash influences. It also featured awesome album artwork by Frank Brunner. 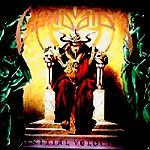 Every serious metalhead should try and find a copy of this album! Perfect Progeny Disaster 1989 This is an awesome Euro-Thrash album with alot more guitar crunch than "Initial Velocity". This album can easily compete with many of the American thrash releases of that time!! This album showed alot of promise and they could have been huge had they not disbanded.